#Pac12AfterDark has some great late-night running back action on Saturdays too. A couple of new challengers have now come to the stage for their College Football Playoff audition. A running back is taking the nation by storm, and I’m not even talking about the best running back in the nation. And if the College Football Playoff started today, I’d have to make some changes to my playoff lineup, although I will hold firm on my playoff projection. Week 4 in college football provided plenty of material to cover in McGuire’s Musings. Time for kickoff. TCU and Georgia each won the only games involving two top 25 teams this past weekend, and each scored a win in impressive enough fashion to thrust themselves into the national playoff picture. So how seriously should we consider the Horned Frogs and Bulldogs? This is something that will gain some steam this week following the weekend’s results, but I am not comfortable enough throwing either into the playoff mix just yet. The reason for that is because I still consider Oklahoma and Alabama the clear favorites in the Big 12 and SEC, respectively. Of the two, TCU would be the team I feel is more likely to make a run for their conference championship. As good as Georgia has looked early on this season (and that win against Notre Dame looks a little better now with the Irish sitting at 3-1), there is nobody in the SEC ready to give Alabama a real run for their championship reign at this time, including Georgia. There are a few things I have come to expect having watched college football over the years. One is that Georgia will undoubtedly take a stumble. Let’s see if they escape a road trip to Knoxville, Tennessee this week and later get out of Auburn with a win. As for TCU, the Big 12 is still a conference with some viable threats for the Horned Frogs. Let’s see which one of these two teams is still standing tall in the national playoff picture one month from now. 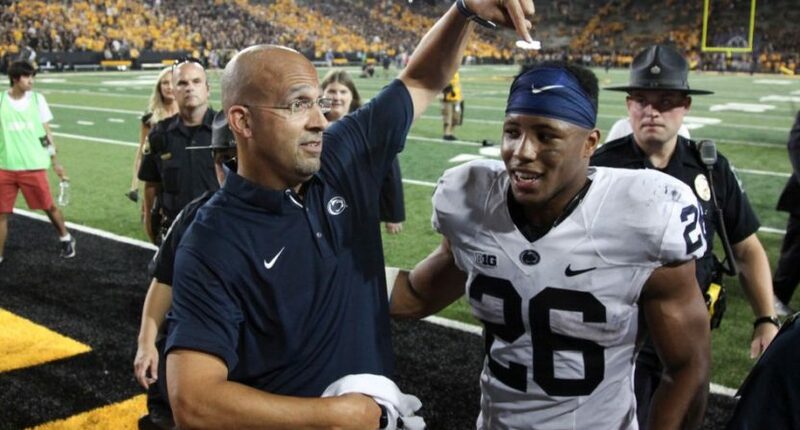 Penn State’s junior running back Saquon Barkley put the team on his shoulders Saturday night in Iowa City as Penn State managed to escape with a last-second win in the Big Ten opener. Barkley is the real deal with his running, catching and blocking, and all three aspects of his game were on display Saturday night against the Hawkeyes. Barkley has not said one way or the other what his plans beyond 2017 are, but it would be an absolute stunner if he is not playing on Sundays next fall. So soak up every little bit of him while you can, because he won’t be playing college football for too much longer. But will he leave with some hardware to show off? Absolutely. Penn State’s star should be the easy favorite for the Doak Walker Award (best RB) after one month of play, and he is making a strong push for Heisman Trophy consideration. Penn State has just one Heisman Trophy winner in program history, but Barkley may have the best chance to become the second that any player has, including players like Ki-Jana Carter, Kerry Collins, and Larry Johnson. For as long as I have been watching this program, Ki-Jana Carter had always been the best running back I had seen. Not anymore. It’s Barkley. Pac-12 After Dark has become a weekly ritual for me, and players like Stanford running back Bryce Love are why. The Cardinal running back ripped UCLA to shreds for 263 yards and a touchdown on Saturday night in the last game of the night. Love now leads the nation in rushing with 787 yards and 196.75 rushing yards per game. The state of California actually has the top two rushing leaders with San Diego State’s Rashaad Penny also rushing for 716 yards. Both Love and Penny are beginning to get more respect and attention from the college football nation, especially those of us who stay up late to watch every minute of college football we can. Will either gain enough notoriety to receive serious Heisman Trophy love? That remains to be seen, especially since Stanford has two losses and Penny is playing in the Mountain West Conference. I’m not suggesting that is fair, but that may be the reality in the end. For the sake of comparison, Barkley has rushed for 518 yards. Stock Up: Georgia. I know I just pointed out how I’m not jumping all in on the Bulldogs just yet, but it is impossible to overlook what has been done. A road win at Notre Dame and a blowout win against Mississippi State sure look good right now. Will that hold up? Stock Down: Florida State. One of my preseason playoff picks is officially off my radar right now after dropping to 0-2 with a loss at home against N.C. State. This team still has to play Clemson and Louisville, and Miami in conference play. Unless there is a big turnaround, Florida State looks to be in some trouble. When a good team loses a tough game, you have to feel bad for their next opponent if they are a struggling program. In the ACC, I felt bad for Kent State coming into the week for having to play at Louisville a week after Clemson shut down the Cardinals on their home turf. But in the world of Division 2 football, it was impossible not to feel bad for Simon Fraser (located in British Columbia, Canada) in the Great Northwest Athletic Conference. They hosted a dangerous Azusa Pacific from California, who had suffered two straight home losses in early conference play, and they were hungry for a win. Boy, did they get it. Azusa Pacific scored 83 points and didn’t even have to score a single point in the fourth quarter to get there. FB: @APUfootball breaks school & GNAC scoring records in 83-7 win over Simon Fraser. The Mountain West Conference took another hit over the weekend when Boise State was ambushed on the blue turf by Virginia, but the weekend also saw conference play begin with yet another statement by San Diego State. The Aztecs are going to be the conference’s best hope for getting a team in the New Year’s Six as the only team in the conference without a loss and every other team in the Mountain West owning at least two losses. Also this past weekend, the MAC’s likely top hope of making a return trip to the New Year’s Six, Toledo, took a loss on the road against Miami, thus failing to secure a siganture win over a ranked power conference team as San Diego State and Memphis had done the previous week. With one loss, Toledo is not completely off the radar (nor is 3-1 Ohio), but the MAC has a long way to go to catch up in the hunt. This is great news for the handful of potential contenders in the American Athletic Conference. The conference is home to three undefeated teams, which is a nice step in the right direction. Has much changed as far as my playoff picture is concerned? Well, actually, yes. It has. If the college football playoff started today, then I would have to take into consideration everything we have witnessed to this point in the season. And because of that, I have some interesting changes to my hypothetical College Football Playoff selections if we were to make them today. This week my hypothetical playoff selection looks drastically different from a week ago given a few developments. First, Alabama no longer has a win against a top 25 team. This is strange because of how Florida State’s schedule has been altered, so I don’t think FSU is your typical 0-2 team, but the Crimson Tide have no wins against ranked opponents, while others in my mix do have some meat on their profile resumes. I’m also nudging Penn State off the playoff board for similar reasons to Alabama, although Alabama’s overall body of work is still more impressive than Penn State’s. That would make for quite the New Years Six bowl in this mock playoff selection. So who do I have in if the playoff were to start this week? Yeah, that looks weird, I admit. But consider the resumes to date. Clemson has two wins against ranked opponents (Auburn and Louisville). So does Georgia (Notre Dame and Mississippi State). Oklahoma has the best road win (Ohio State), and TCU is next in line thanks to a win at Oklahoma State. Who you play matters to the selection committee, and through the first four weeks these are the teams who have built the best profiles. It won’t end that way. In fact, my latest playoff projection has not changed all that much for me. In fact, it looks exactly as I had it last week. I’m still suspecting the Pac-12 will hurt itself as we go along. USC continues to flirt with a loss (but credit the Trojans for continuing to flip a switch in the fourth quarter), and Stanford still looks like a potential hurdle for Washington (and Washington State?) in the north. While I would place Clemson ahead of Alabama, I’m not sure the committee will feel the same way, which is why I’ll keep the Tide atop the projection. Oklahoma remains ahead of Penn State in the major polls, but if the season continues this way, then Penn State will have a chance to nudge ahead of the Sooners with wins against Michigan and Ohio State (Oklahoma has a road win at Ohio State, and Penn State will play there later this season). The team not in my playoff field I still continue to watch closely is Ohio State. The Buckeyes getting the Nittany Lions at home is the swing game for my Big Ten spot in the playoff. If Ohio State tops Penn State, then the Buckeyes are right back in the playoff in my book, although they would be fourth in the pecking order behind Oklahoma. We are getting closer and closer to the first College Fotoball Playoff rankings from the selection committee, and I will re-evaluate my official projection once the first batch of rankings is revealed. Until then, it’s a total guessing game.